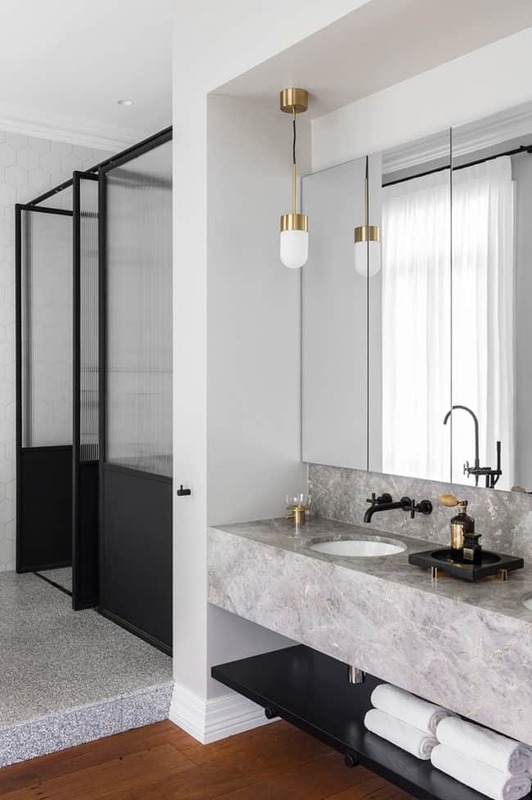 Pendants in the Bathroom: Passing Fad or New Fresh Classic? Sorry I’m late this morning! I’ve been in the “pinning” phase of design for our big remodel (Kitchen, pantry/laundry, mudroom, master suite — stayed tuned for all the goodies!! Earnest planning begins this winter! ), and so have been searching through master bath inspiration a lot lately. Our master bath is probably the biggest question mark for the whole project. We will be converting the guest suite of the 1970s addition to our 1790 house into our master suite, and, as it stands, the current bath space is very small — big enough to hold an alcove tub, a 60″ console, and a toilet. There are no windows. While I’d LOVE to add on a bath — not even a big one, just bigger, and with some natural light — that could add $20K-$30K to the project that could be spent elsewhere, or just not spent at all. Believe me, I’m just grateful to be getting our own bathroom!! We’ve shared a bath with Things 1 & 2 for the last 6 years. So the ideas that I’ve been tossing around are ones that could potentially work for both a new and a converted small space. One of those ideas is the use of mini pendants. Pendants in the Bathroom: Fad or Fresh Classic? Using mini pendants for vanity lighting in the bathroom has been around for a few years now, but lately I’ve really noticed an uptick in prevalence. Anyone else? I’m not necessarily for or against it. I’ve seen some really great bathroom designs using mini pendants, some ok ones, and some, “Oh, I wish they hadn’t gone there” ones, too. It got me to thinking … hmmmmm … what will prospective homebuyers think about this design element in 5-10 years? In an ideal world, I prefer my own vanity lighting to illuminate from the side, hung with the bulb at about 66″ from the floor, and have an opal-shaded bulb of some sort. It’s the best way to get even light distribution. I’m not pretty in the morning, so my face can use all the soft, luminous light I can get! 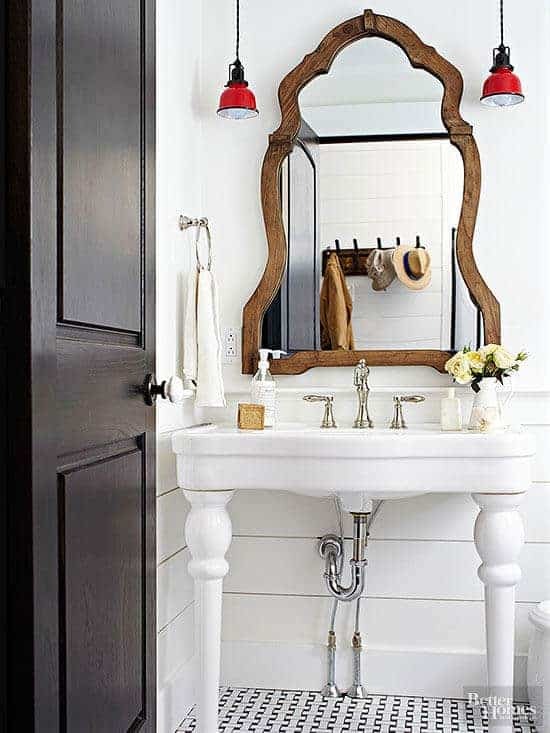 Not everyone has room for vertical fixtures and must use an over-mirror fixture. No biggie. I don’t live in an ideal world, either. And then there’s the design factor to consider — sometimes a person cares more about how the bathroom looks than how the bathroom makes her look. I understand that, too; I’m a decorator, after all, not a personal stylist! Bring on the over-mirror light and the bare bulbs in that case! Mini pendants can help in both situations. 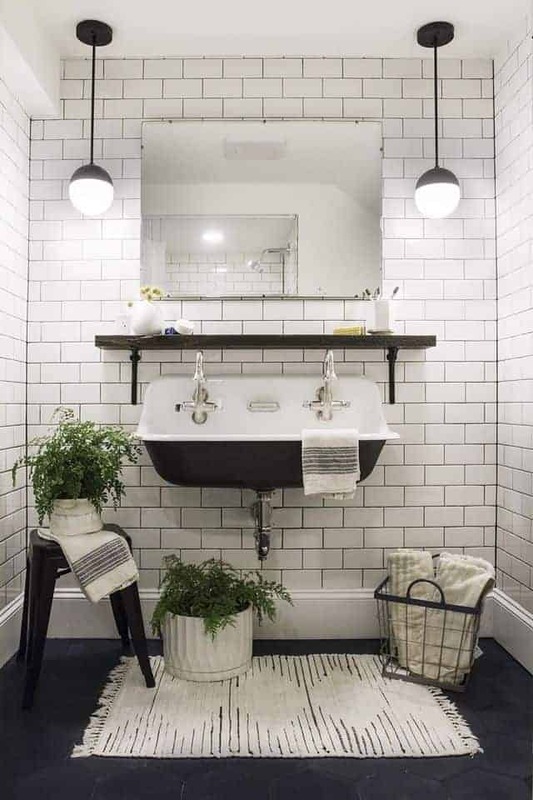 If your bathroom is space challenged, you can hang them more closely spaced than you might vertical wall mounts, overlapping the edges of a mirror just a bit, but still get that attractive lateral light. Now, I haven’t been decorating our own home with resale in mind. Barring major life upheaval, we intend this to be our forever home, so my thought is to decorate in a way that is architecturally-inspired (as I recommend to ALL my clients and readers) and then put our own twist on things. Even so, I tend to look toward the long haul and not be caught up in trends. To help you decide, I have a roundup of some very affordable, seriously cute, and totally tempting mini pendants. Ha! I sound like a fashion blogger! Most of these come in multiple finishes, so if you like the shape but don’t see the finish you need, try it anyway! Honestly, Littman Brands’ new Mitzi line has a fabulous array of affordable, really cute lighting — many more mini pendants, too. Expect to see a lot of Mitzi in the magazines soon. So… what do you think? Fad or fresh classic? Take another look at that first photo. Now imagine trying to use that medicine cabinet… my aunt had that situation in her bathroom in the 80s. Giant PITA. Hi Nicola! Nice to hear from a new commenter. Thanks for your well-considered thoughts! I have a feeling that the medicine cabinet in the first image is only partially functional — the part that would open without being impeded by the sconces. It was done by a very high end modern design firm, and I have a feeling that they made a compromise between function and form. I agree with what you say about the bare bulbs. I really do prefer an opal bulb, myself. And as for the weird shadow sconces, yes to that as well, unless the ambient lighting overall were very good. But that would be the case whether one used them in a kitchen, suspended in an entry, or anywhere really.